Tag team wrestling is heating up in AAPW. There are new champs in Christian Rose and Matt Cage and teams are lining up for a shot at the gold. Rose and Cage have said they're enacting their 30 day defense clause and refuse to wrestle at Main Event. But fans will still get tag team action that night. The winners of the Convoy vs. the Money Makin' Jam Boys will likely get the chance to face the champs in the near future. The Money Makin' Jam Boys ("Main Attraction" KC Jackson & the Mississippi Man) have held the AAPW tag team titles before. Over the last several months on Collision they've gone their separate ways, but appear to be focused now on reuniting and regaining the gold belts they held so proudly. 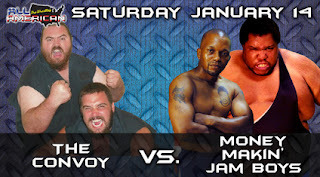 If you've never seen the Mississippi Mad Man in person before, I encourage you to come out and watch him at Main Event. At more than 450 pounds, this guy is a beast. He yelps at his opponents to further intimidate them. KC rounds out the team with a steady stream of match based wrestling and aerial assaults when the time is right. The Jam Boys hope to end up winners here with a chance at becoming the company's first 4 time tag team champions. The Convoy though will be a tough team to beat. Both Roscoe Dwayne Harris and Jimmy Wayne Fargo are tough as nails. They're also still upset about losing to Heath Hatton in a handicap match at Fan Fest back in November. This motivation, plus the fact that they want to add the tag team titles to their resume will make this a great contest. Join us at AAPW Main Event on January 14. Tickets are just $10, and you can buy them by clicking this link. Bell time is 6:45 p.m. at Black Diamond Harley Davidson in Marion, Illinois. We hope to see you there.